From 8thOctober 2012 to 21st October 2012, Seri Pacific Hotel Kuala Lumpur (SPHKL) will spoil diners with an array of Thai delicacies, all prepared authentically by Thai Chefs, Mrs. Sirikan Phosawas and Mr. Somchai Jaiyen all the way from Bangkok. 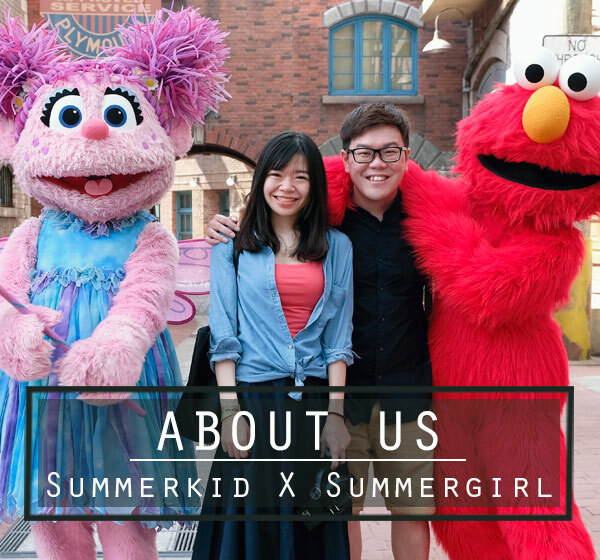 The flavours of Thailand focus more on seafood such as fish, prawns squids, and also chicken which takes up a huge role among all dishes served. There are three menus on routine for this buffet, hence customers will get different menu on different days. We were on the Day 2 menu during our visit, so let’s follow us on the sumptuous spread we had tried out. We started off with appetizer and salad such as Rojak Buah-buahan in Claypot and Acar Rampai/ Acar Mentah which are available daily. Other appetizers on the routine menu are Thai Chicken Salad with Lemongrass, Chillies & Herbs, Tod Mad Pla (Deep Fried Fish Cake), Citrius Chicken Salad with Asparagus and Potato salad with Gherkin & Beef Salad. 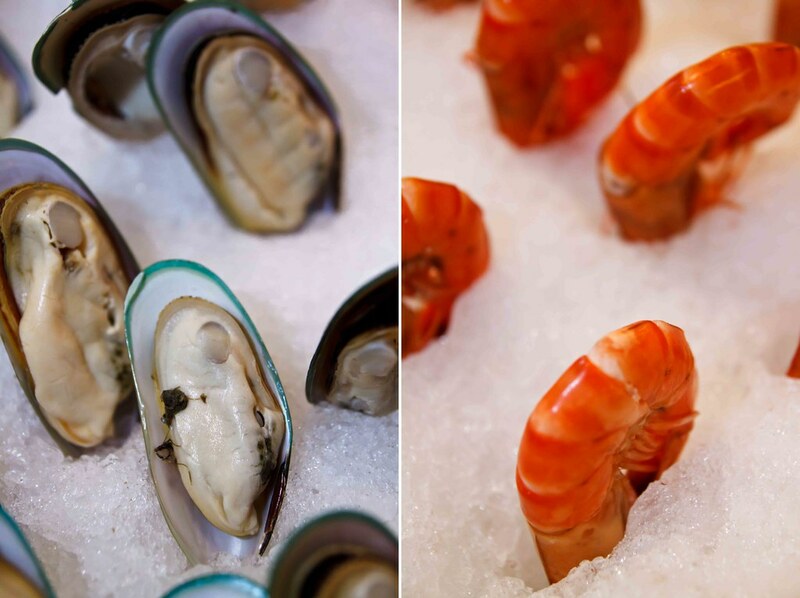 Though themed Thai buffet, there are also some Western delights such as Seafood on Ice available. Mussels, poached Tiger Prawn, Marinated Octopus, choose the one you like. A wide range of greens such as lettuce, baby tomato , cucumber, red & green capsicum, baby sprout and baby carrot with condiments ( Thousand Island sauce, Caesar dressing and Italian dressings) are available for DIY at the salad bar too. For those who like to have some soups to warm up their stomach before the mains, scoop on a bowl of Spicy Chicken in Fresh Coconut Milk or Cream of Wild Mushroom soup. Both the soups are creamy with thick consistency. The Spicy Chicken in Fresh Coconut Milk, though rated with the name spicy, it is not spicy after all, very much alike to green curry chicken but minus the spiciness. After the appetizer, continue the gastronomic journey with hot dishes such as Chicken Massaman, Steamed Fish with Ginger, Green Curry with Fish Ball, Panang Beef, Stir Fried Prawn Chicken with Hot Basil, Wok Fried Crab with Plum Sauce, and Stir Fried Vegetables with Oyster Sauce and Braised Tofu with Belacan Paste. Among all, we love the Braised Tofu with Belacan sauce the most for it is outstanding with the flavor of belacan and extra spiciness. For those who can’t live without carbohydrate, fill your plates with Thai Fried Rice, Steamed Rice and Shepherd Pie. We normally don’t put much expectation on rice dishes during buffet as we feel that they are a waste of tummy space. However, the Thai Fried Rice surprises us with the flavourful taste and fluffy rice, and we got ourselves three helpings in total. The Shepherd Pie with creamy minced lamb filling and golden yellow mashed potato, is not bad too. At the Cavery station, speciallity of the day is available. On the day of our visit, Thailand Baked Fish with Sauce is served. Looks tempting but taste rather dry, there is still room of improvement for this dish. Roasted Lamb with Green Curry Sauce and Roasted Strip with Red Curry Sauce are available on the other two routine menus. 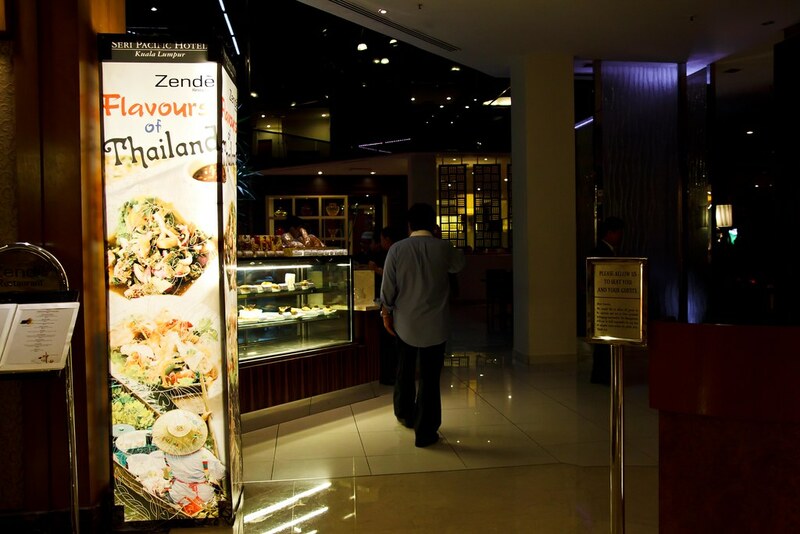 Moving on the long buffet counter, one will find two Thailand Stalls which are available daily. One will be the Thai Chicken Noodles Soup/ Thai Seafood Noodles Soup stall while the other stall serves Som Tam & Miang Kam. 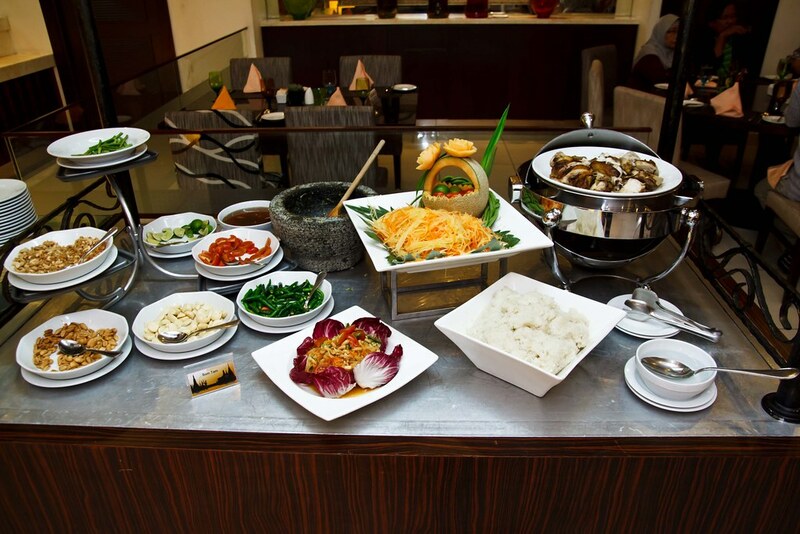 In this buffet, only a few dishes are in high spicy level, and the Som Tam & Miang Kam are among the few. We like both of them, for the spiciness do trigger our taste buds and opens up the appetite. Located at the end corner of the buffet is the grilled themed station, where a variety of marinated seafood and meats such as prawns, chicken in pandan leaves, fish and squid are available. All raw ingredients are cooked upon order and served pipping hot hence there is no complains on the freshness and good taste of these grilled dishes. 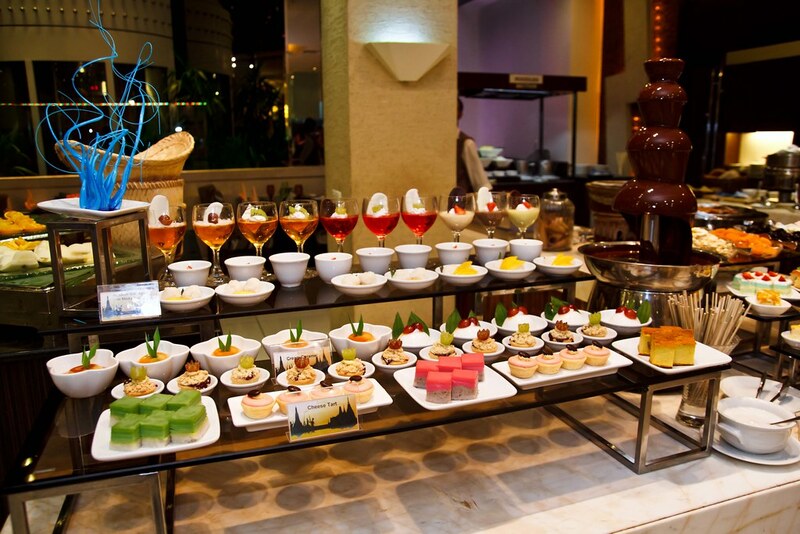 After all the delicious mains, continue to pamper your stomach with the many desserts at the desserts counter. Here, drifts into view are wide choices of cakes, tarts, pudding and jelly such as chocolate cake, mango tiramisu, coffee cheese slice, blackcurrant jelly, pandan cheese slice, pumpkin custard, mango in sticky rice. All are served in petite sizes so that one can try out more varieties. 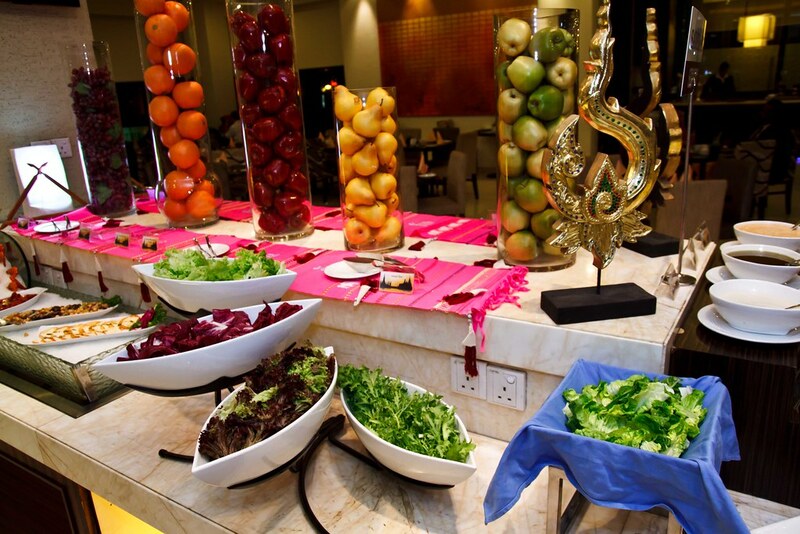 Fruits, chocolate fountain with condiments and ice-creams are available as well. Don’t forget to top your ice creams with chocolate rice, roasted almond, kidney beans and marshmallow for extra sensation. 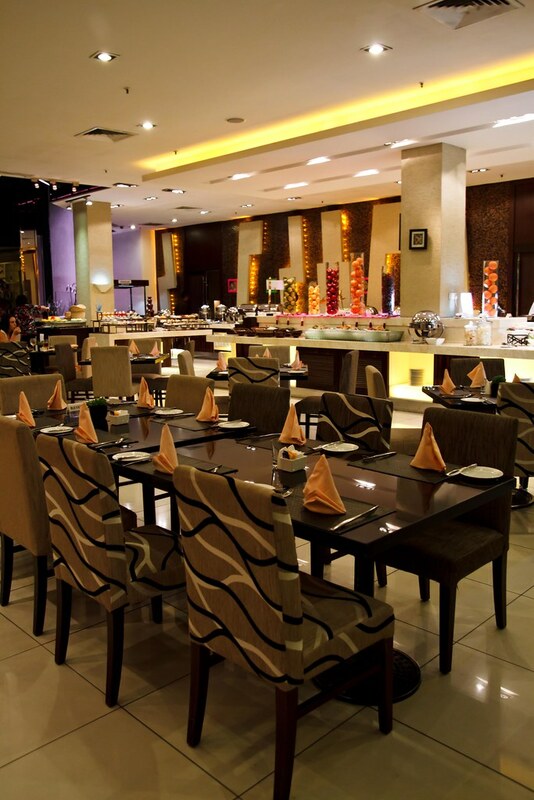 The buffet is priced at RM55 nett per person for lunch and RM78 nett per person for dinner. 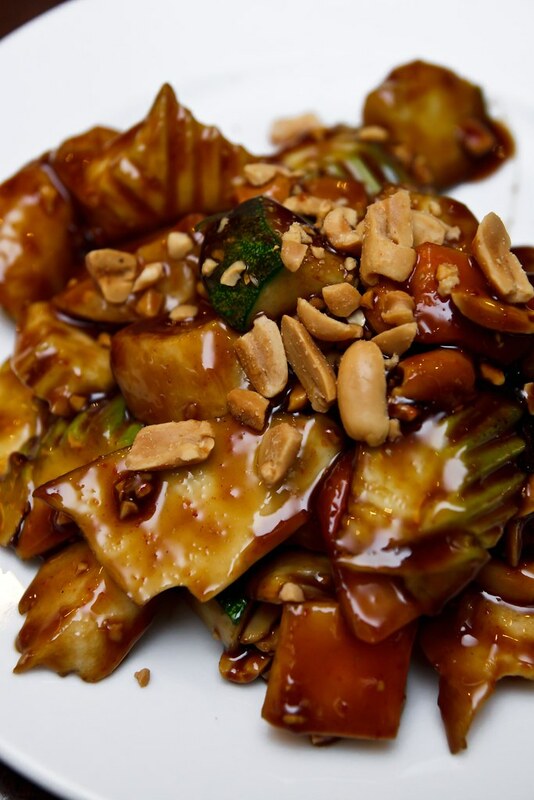 So come over and spice up your taste buds with this Thai affair before 21st October 2012. Jalan Putra, 50350 Kuala Lumpur.